It's almost time for school to start back, can you believe it?! I always like to do something special to celebrate the beginning of another year for my son. One year we went to the park to feed the ducks early one Sunday morning, then had brunch. We went to see a movie he wanted to see one year. Another time we went for ice cream the night before school started! If you like to celebrate back to school, I've got a fun idea: take your kids on a trip back in time at Medieval Times at Sugarloaf Mills! We took our first trip to Medieval Times a few weeks ago and it was a blast! We got there about 1 hour and 15 minutes before the show, and there was a line already - it is popular! 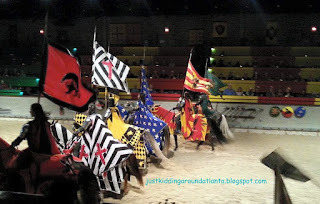 When you arrive you will be given a crown with the color(s) of the Knight you will be cheering for. If you'd like, you can have your picture taken with the King before you enter the huge gathering area. Relax and enjoy cold drinks for everyone from the bar - they have smoothies for the kids. Visit the Dungeon (there's a nominal charge for this). Check out the beautiful offerings in the gift shop. You can even visit with some of the cast members before the show begins. Before long, they will call you to the doors and begin letting you in, one color at a time. Proudly wearing our black and white crowns! Once inside the arena, you are seated at long tables, grouped by the colors of your Knight. Your server will let you know the drink choices, and before long, your drinks, garlic bread and soup are in front of you. One note here - everything is served without utensils. You are, of course, in the middle ages! Your soup is in a bowl that you can sip out of. We went with our friends Tiffany & Seth, and Tiffany brought along plastic cutlery for us to use, thank goodness! So, you may wish to bring your own if you prefer to eat with a fork & spoon and not your fingers! About this time, the show began. 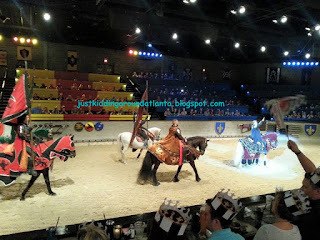 Beautiful horses, Royalty, the Royal Falconer, and a storyline that will have your family cheering loudly for your Knight! 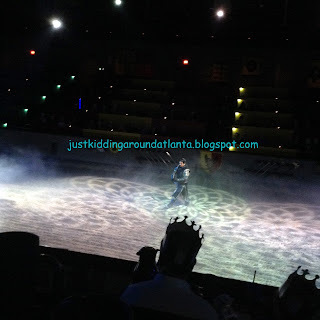 My son's favorite was the horses - he really enjoyed watching them perform. The Falconer was fascinating to watch, as well. 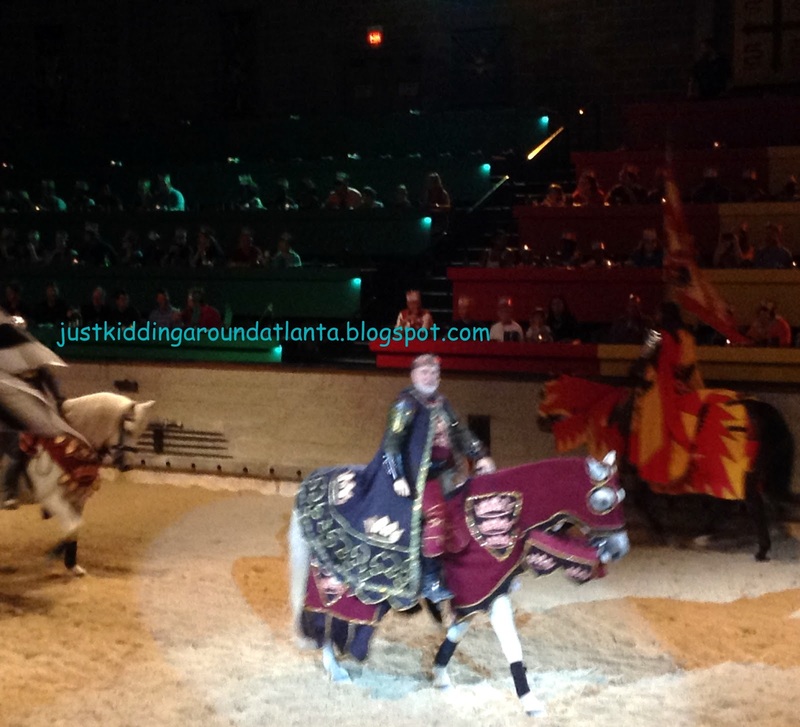 And then came the jousting - I was really surprised at how much David got a kick out of that! 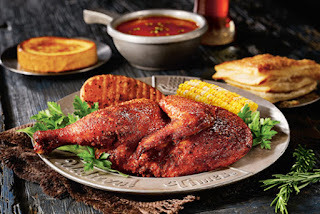 While we watched, we were served our main course of chicken with corn on the cob and potatoes. Everything was delicious and so filling. After your plates are cleared, you'll receive an apple pastry and coffee, if you'd like. They also offer to-go boxes if you can't finish everything. There is a vegetarian meal available if you let them know when you book your tickets. Medieval Times was a wonderful experience. Before we visited, I wasn't sure if I would like it, but I am glad I was wrong! 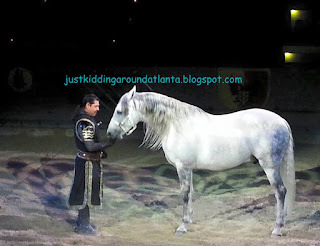 It is a great family attraction, and to see those beautiful horses performing was magical. That's why I think this makes a great back to school tradition - it's so special and unique! Your kiddos will definitely remember this night. And if you homeschool like we do, you'll love the Partners in Education pages Medieval Times has on their website. I really appreciate that our special night out can be turned into a history lesson for David, too! David & his friend Seth joined us! 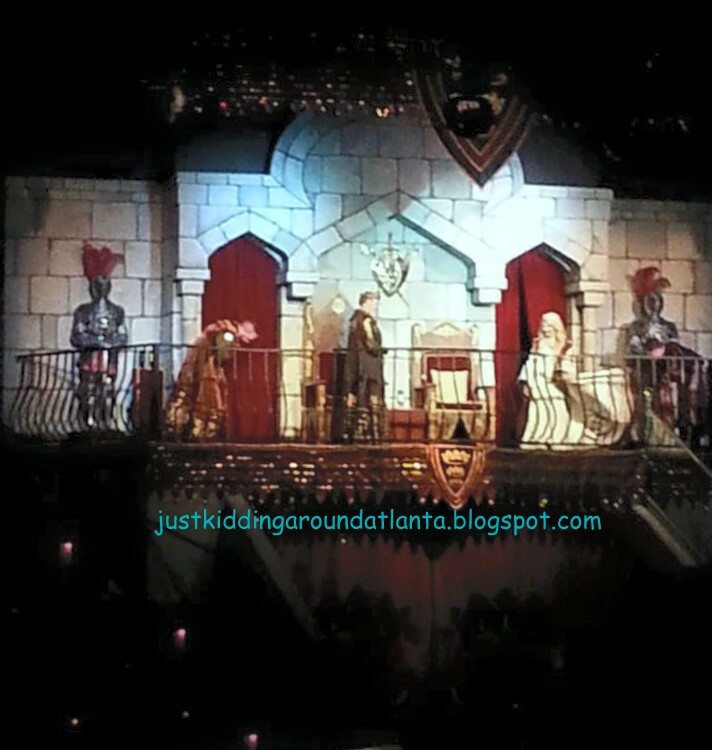 I don't want to spoil the show for you, so I won't give many details, but here are some pics of our night out at Medieval Times. 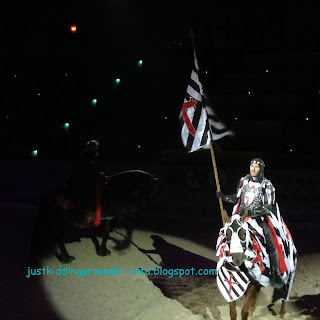 We cheered for the Black and White Knight! 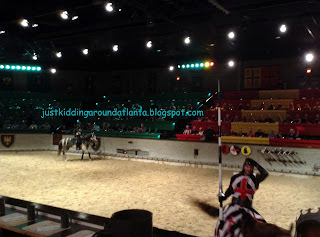 I highly recommend visiting Medieval Times for your special family night, or celebration. It's something you won't soon forget! We had a wonderful time with our friends, enjoying a delicious dinner and an exciting show. I am sure we will be back again! 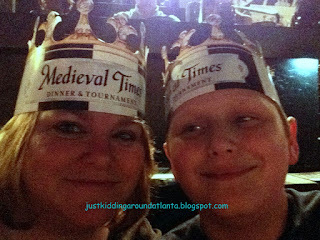 There are some great specials on the Medieval Times website right now - check them out here. 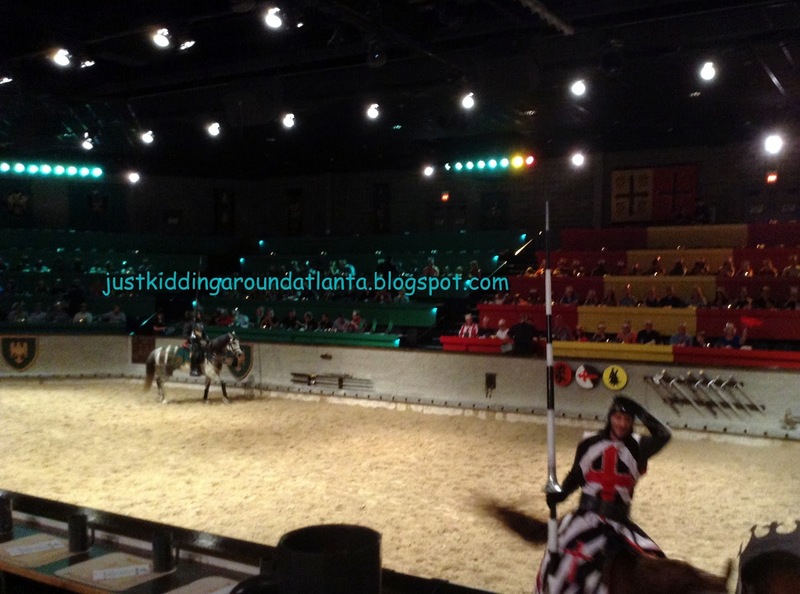 They also offer discounts for military families and free admission on your birthday. Medieval Times is located at 5900 Sugarloaf Pkwy, Lawrenceville, Georgia 30043 in the Sugarloaf Mills Mall. 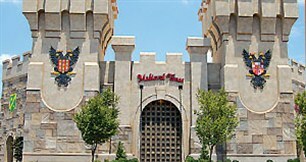 It is on the back side of the Mall and you can't miss it - just look for the big castle! 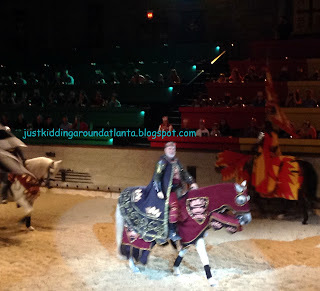 Medieval Times provided complimentary admission for us to attend in order to facilitate this review. No other compensation was received. Looks like yall had a great time!!! Tj and I need to go on a date there! I bet you had a blast. 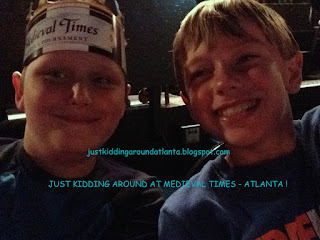 Medieval Times is something that I plan to do with my 8 yr old son. There is one in Kissimmee, Fl here.